The Crazy Bookworm: Little Fish: A Memoir from a Different Kind of Year: Review + Giveaway! Little Fish: A Memoir from a Different Kind of Year: Review + Giveaway! 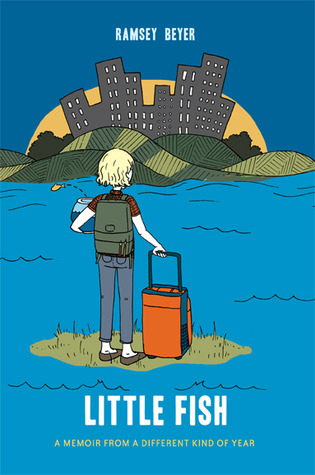 Told through real-life, collages, lists, and drawings, this coming- of-age story illustrates the transformation of an 18-year-old girl from a small town teenager into an independent city-dwelling college student. Written in autobiographical style with beautiful artwork, Little Fish shows the challenges of being a young person facing the world on her own for the very first time and the unease --as well as excitement-- that comes along with that challenge. 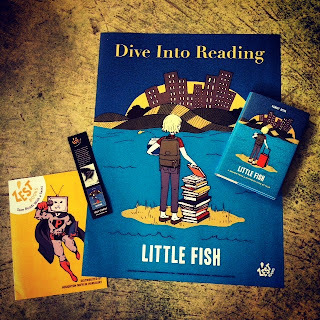 If a Teenager could only read one book this Fall, Little Fish should be the one! Why? Because inside these pages, you will meet a girl, relate with this girl, and by the end befriend her in the best of ways. You will finish this book with a new friend and a new outlook on the adventure that is growing up. I absolutely LOVED this memoir. I don't even think I could put it into enough words how I felt about this book. Ramsey Beyer crafted such a refreshing, unique memoir that will have you devouring it in just one sitting(Go ahead, I dare you to try and put it down!). The author expressed herself so vividly, that you felt as if you were right there beside her, going about this experience with her. I am hearing the word 'Graphic Novel' being tossed around when describing this book; Yes, it does share similarities to a graphic novel style, but it is so much more! If Graphic Novels aren't your thing, please don't let that deter you from reading this book. I can confidently promise you, you will be beyond surprised how beautifully crafted and delivered this memoir is. I just adored this memoir, and will recommend it to everyone I knew. It should be read by anyone who is starting a new chapter in their life(not necessarily just school) but starting anew in some way or another. One of my most favourite coming-of-age stories I have ever read! The awesome folks over at Zest Books are kind enough to offer a wicked giveaway for you! My story was the reverse, I went from a big city to a small village and found it difficult to fit in. I think this is a sign for me. It was released on my birthday. Cannot wait to read this. Cathy, many thanks for your kind review. We're so happy you loved Little Fish! I loved this one too. It is such a fun and creative way to chronicle her freshman year of college.